Absolute value graph : As this graph contains positive and negative values so this graph does not look like a line graph, which you have studied it earlier. Whenever we have to Graph Absolute value, we have to consider positive values and negative values for x. The general shape will look like a 'v' (or in some cases, an upside down 'v' as we will see later). 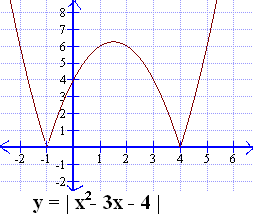 This is main absolute value-graph with center as origin y = |x| . 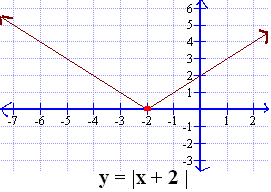 If there is any number in the absolute sign then that number is the vertex of that V graph. 1)	If y = | x + a| then the vertex will shift ‘ a’ units to left. 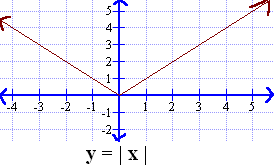 Example : y = | x + 2| then the vertex will shift to 2 units to left. 2)	If y = | x – a | then the vertex will shift to ‘a’ units to right side. 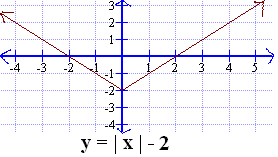 Example : y = | x - 2| then the vertex will shift to 2 units to right. 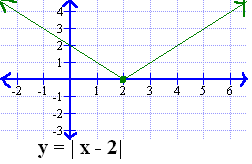 3)	If y = | x | + a then the graph will shift ‘a’ units up. Example : y = |x | + 2 then the vertex will shift 2 units up. 4)	If y = | x | - a then the graph will shift ‘a’ units down. 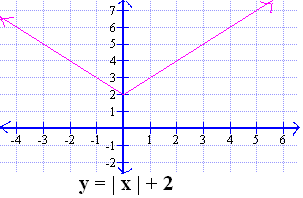 Example : y = |x| - 2 then the graph will shift 2 units down.